Cast and crew from "Whip It" film a street scene in Ypsilanti during the summer of 2008. Another film, "Betty Anne Waters" will start shooting in Ypsilanti next month. Feb. 23, 2009 · 11:08 a.m.
Ypsilanti will play home to another movie shoot next month. 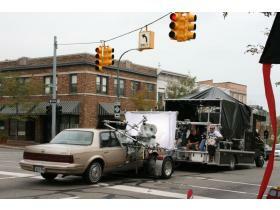 On March 16, filming for the movie “Betty Anne Waters,” will carry over to Downtown Ypsilanti. Starring Hilary Swank, Minnie Driver and Sam Rockwell, the movie has already been filmed in Ann Arbor and Chelsea. Much of the filming is scheduled to take place in and around the Freeman Bunting Insurance building on Michigan Avenue. Parking spaces on both sides of Michigan Avenue will be utilized for the movie, as well as much of the parking lot behind the building. Throughout the first half of the day filming will take place on Michigan Avenue itself, which will lead to short, two to five minute, street closures from Washington to Huron streets. The movie’s filming was discussed at the Downtown Association of Ypsilanti’s meeting last week. Several business owners discussed this movie in comparison to the filming from last summer. This will be the second time Ypsilanti has been home to major motion picture shoot, with the filming of “Whip It,” starring Drew Barrymore and Ellen Page, this summer. “Whip It,” about a girl who discovers the sport of roller derby in her small Texas community, is set for release this fall. Though some complained of the inconvenience from last summer’s filming, most seemed excited of the prospects the filming industry can bring to the city. Some business owners suggested the idea of creating banners and offering discounts based on the film’s title or theme. They also touted the idea of going in on gift baskets of samples of what Ypsilanti’s local businesses have to offer. “It will be a lot more cost effective for us to go into this together,” a representative from Vivid Imaging Studios said at the meeting. “Betty Anne Waters” is the true story of a working mother in Massachusetts, who puts herself through law school to represent her brother after his murder conviction. Filming for the movie is also scheduled for Depot Town at a later date. Stay tuned the Citizen for more on this story as it develops.